This is a new service that Tickle My Face is offering in 2019. We are in the process of adding more pictures so you know exactly what to expect! Please feel free to email, text, or call with any questions. 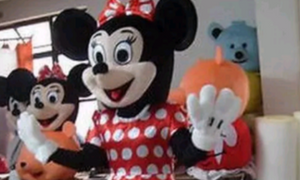 Invite this mouse to your party to say hi to the kids and take photos! He will arrive with his handler. $90 for 30 minutes, $160 for one hour. 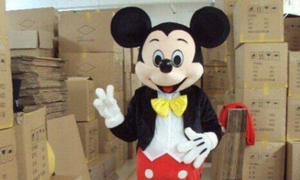 Invite this mouse to your party to say hi to the kids and take photos! She will arrive with her handler. $90 for 30 minutes and $160 for one hour. Please add a flat $50 to the price of the services you are booking. Our Ice Princess is a costumed artist. She wears a high quality beaded blue dress with a train and has blonde hair in a braid. In addition to her talented face painting skills and amazing balloon twisting, she can also do glitter tattoos, story telling, hair braiding, and nails. This costumed artist is only available at indoor or residential events as her costume does include a train and is very high quality. Our Green Fairy is a costumed artist. In addition to her talented face painting skills and balloon twisting, she can also does glitter tattoos, story telling, hair braiding, and nails. Our Mermaid is a costumed artist. She is in full mermaid attire, wig included. She can do expert face painting, balloon twisting and glitter tattoos.